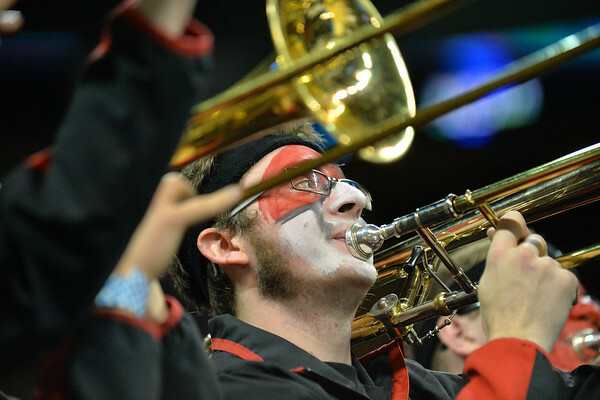 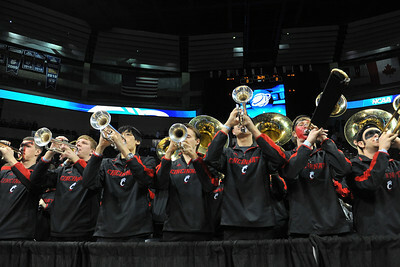 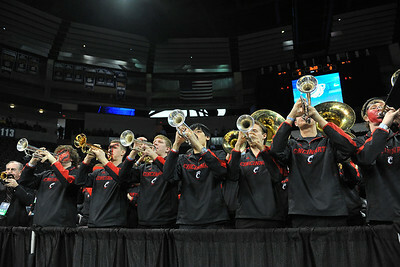 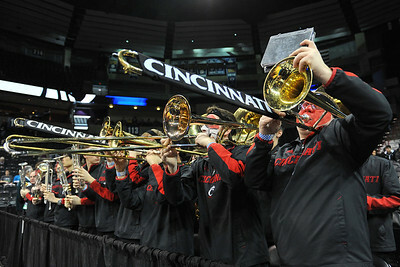 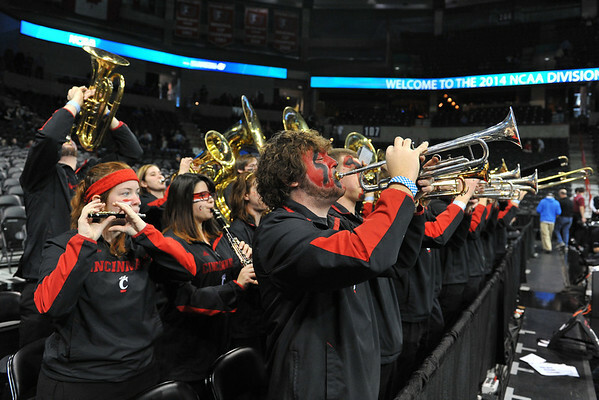 March 20, 2014: The Cincinnati pep band plays before a second round game of the NCAA Division I Men's Basketball Championship between the 5-seed Cincinnati Bearcats and the 12-seed Harvard Crimson at Spokane Arena in Spokane, Wash. Harvard defeated Cincinnati 61-57. 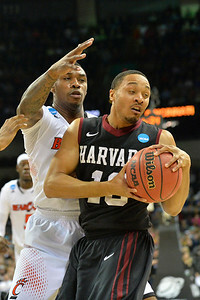 March 20, 2014: Harvard Crimson guard Brandyn Curry (10) grabs a high pass during a second round game of the NCAA Division I Men's Basketball Championship between the 5-seed Cincinnati Bearcats and the 12-seed Harvard Crimson at Spokane Arena in Spokane, Wash. Harvard defeated Cincinnati 61-57. 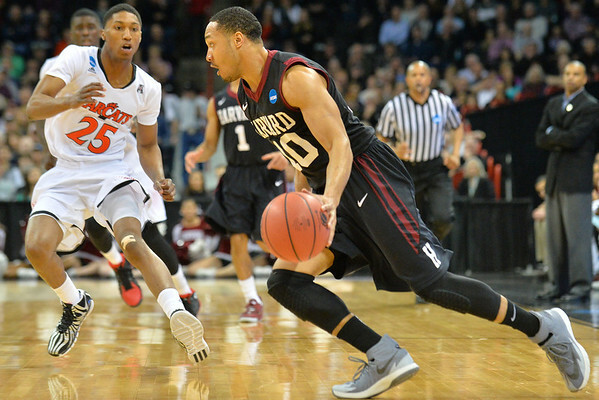 March 20, 2014: Harvard Crimson guard Brandyn Curry (10) dribbles during a second round game of the NCAA Division I Men's Basketball Championship between the 5-seed Cincinnati Bearcats and the 12-seed Harvard Crimson at Spokane Arena in Spokane, Wash. Harvard defeated Cincinnati 61-57. 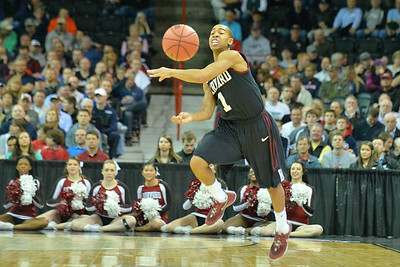 March 20, 2014: Harvard Crimson guard Siyani Chambers (1) calls a play during a second round game of the NCAA Division I Men's Basketball Championship between the 5-seed Cincinnati Bearcats and the 12-seed Harvard Crimson at Spokane Arena in Spokane, Wash. Harvard defeated Cincinnati 61-57. 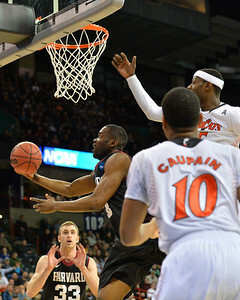 March 20, 2014: Harvard Crimson guard/forward Agunwa Okolie (35) gets a layup during a second round game of the NCAA Division I Men's Basketball Championship between the 5-seed Cincinnati Bearcats and the 12-seed Harvard Crimson at Spokane Arena in Spokane, Wash. Harvard defeated Cincinnati 61-57. 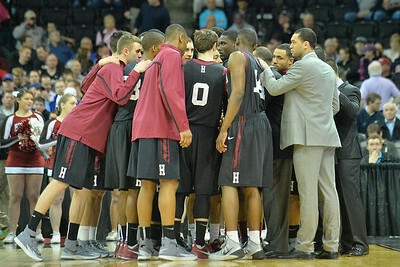 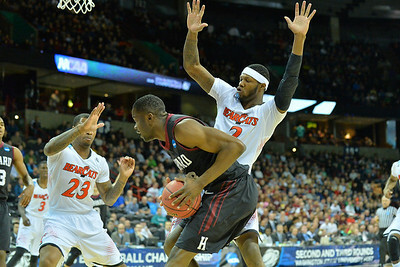 March 20, 2014: Harvard Crimson guard/forward Agunwa Okolie (35) passes inside during a second round game of the NCAA Division I Men's Basketball Championship between the 5-seed Cincinnati Bearcats and the 12-seed Harvard Crimson at Spokane Arena in Spokane, Wash. Harvard defeated Cincinnati 61-57. 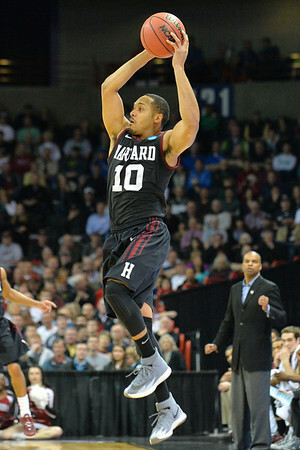 March 20, 2014: Harvard Crimson forward Steve Moundou-Missi (14) goes up for a layup during a second round game of the NCAA Division I Men's Basketball Championship between the 5-seed Cincinnati Bearcats and the 12-seed Harvard Crimson at Spokane Arena in Spokane, Wash. Harvard defeated Cincinnati 61-57. 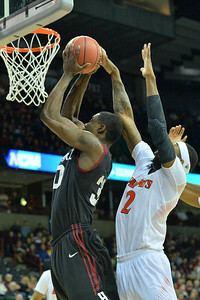 March 20, 2014: Cincinnati Bearcats forward Shaquille Thomas (3) blocks a shot attempt from Harvard Crimson forward Evan Cummins (33) during a second round game of the NCAA Division I Men's Basketball Championship between the 5-seed Cincinnati Bearcats and the 12-seed Harvard Crimson at Spokane Arena in Spokane, Wash. Harvard defeated Cincinnati 61-57. 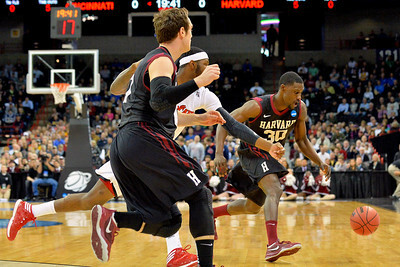 March 20, 2014: Harvard Crimson guard Laurent Rivard (0) contests a three point shot from Cincinnati Bearcats forward Shaquille Thomas (3) during a second round game of the NCAA Division I Men's Basketball Championship between the 5-seed Cincinnati Bearcats and the 12-seed Harvard Crimson at Spokane Arena in Spokane, Wash. Harvard defeated Cincinnati 61-57. 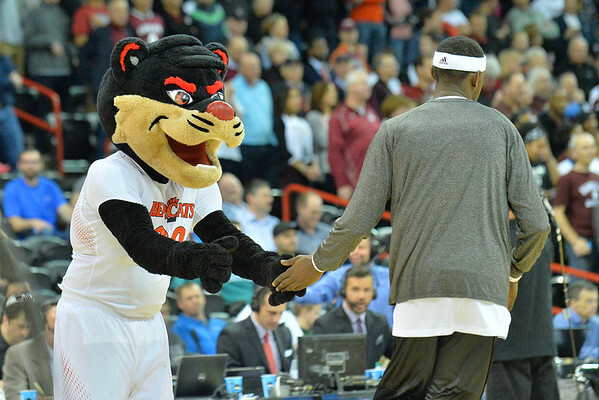 March 20, 2014: Cincinnati Bearcats forward Jermaine Lawrence (11) and Cincinnati Bearcats guard Sean Kilpatrick (23) guard Harvard Crimson guard Brandyn Curry (10) during a second round game of the NCAA Division I Men's Basketball Championship between the 5-seed Cincinnati Bearcats and the 12-seed Harvard Crimson at Spokane Arena in Spokane, Wash. Harvard defeated Cincinnati 61-57. 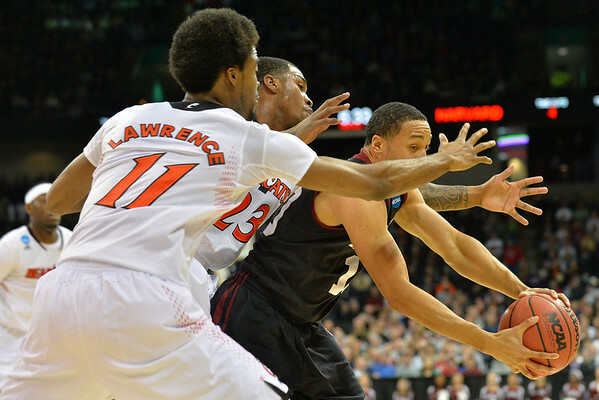 March 20, 2014: Harvard Crimson guard Brandyn Curry (10) looks to get past the Cincinnati Bearcats defense during a second round game of the NCAA Division I Men's Basketball Championship between the 5-seed Cincinnati Bearcats and the 12-seed Harvard Crimson at Spokane Arena in Spokane, Wash. Harvard defeated Cincinnati 61-57. 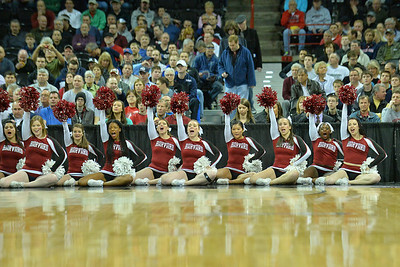 March 20, 2014: A Harvard Crimson cheerleader performs during a second round game of the NCAA Division I Men's Basketball Championship between the 5-seed Cincinnati Bearcats and the 12-seed Harvard Crimson at Spokane Arena in Spokane, Wash. Harvard defeated Cincinnati 61-57. 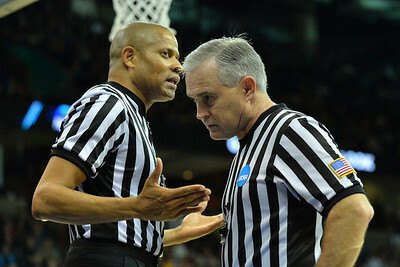 March 20, 2014: A pair of officials talk during a second round game of the NCAA Division I Men's Basketball Championship between the 5-seed Cincinnati Bearcats and the 12-seed Harvard Crimson at Spokane Arena in Spokane, Wash. Harvard defeated Cincinnati 61-57. 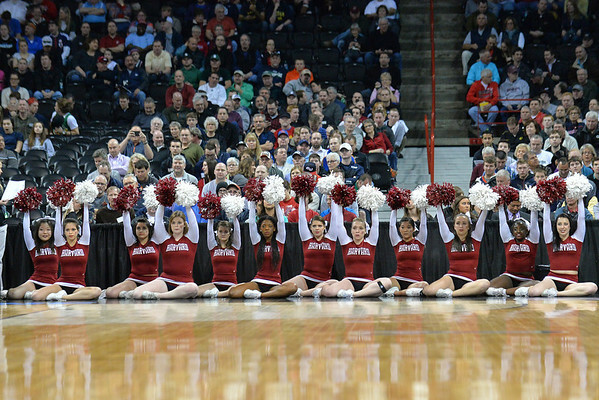 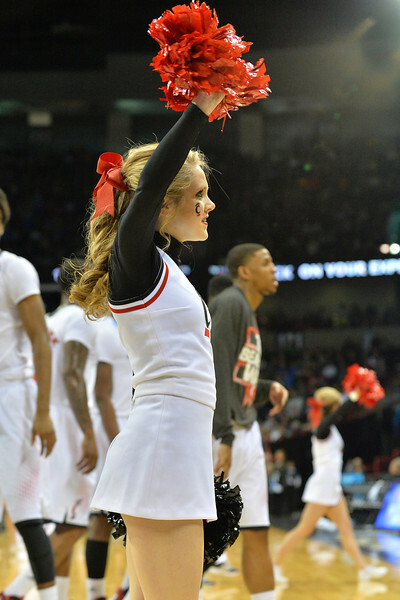 March 20, 2014: Cincinnati Bearcats cheerleaders perform during a second round game of the NCAA Division I Men's Basketball Championship between the 5-seed Cincinnati Bearcats and the 12-seed Harvard Crimson at Spokane Arena in Spokane, Wash. Harvard defeated Cincinnati 61-57. 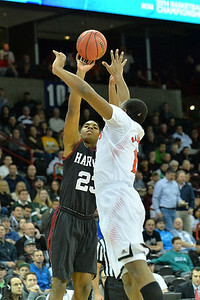 March 20, 2014: Harvard Crimson guard Brandyn Curry (10) shoots over Cincinnati Bearcats forward Titus Rubles (2) during a second round game of the NCAA Division I Men's Basketball Championship between the 5-seed Cincinnati Bearcats and the 12-seed Harvard Crimson at Spokane Arena in Spokane, Wash. Harvard defeated Cincinnati 61-57. 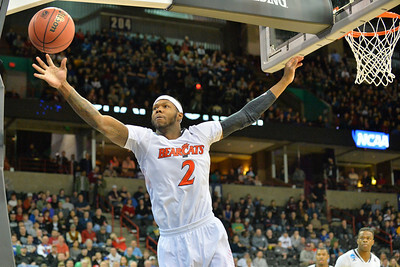 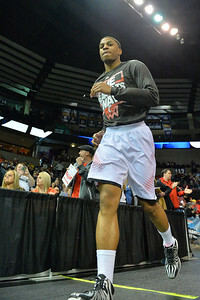 March 20, 2014: Cincinnati Bearcats forward Justin Jackson (5) calls for the ball during a second round game of the NCAA Division I Men's Basketball Championship between the 5-seed Cincinnati Bearcats and the 12-seed Harvard Crimson at Spokane Arena in Spokane, Wash. Harvard defeated Cincinnati 61-57.